Dash camera footage captured the terrifying moment when a small plane narrowly misses the vehicle’s front hood as it careens across a busy road north of Toronto. Police said the single-engine plane lost control right after taking off from a runway at Buttonville Airport in Markham, Ont. around 2 p.m. on Tuesday afternoon. Investigators say the Cirrus SR20 aircraft didn’t gain enough altitude during takeoff and crashed through a fence before narrowly missing traffic on 16th Avenue near Highway 404 where the dash camera video was taken. In the video, the plane can be seen flying dangerously low over the road as one of its wings just misses the front of the vehicle. “That [the] aircraft wasn’t involved in a collision with a vehicle coming through here is quite amazing,” York Regional Police Sgt. Dave Mitchell told CTV Toronto. The privately owned plane then crashed into a ditch on the other side of the road where it sustained significant damage to its nose and sides, police said. Mitchell said a male instructor and a female student who were inside the plane were uninjured in the crash. 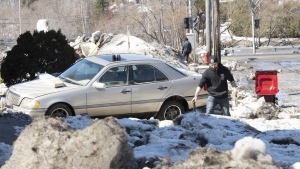 No motorists were injured in the collision either. The TSB said the instructor was piloting the plane at the time of the accident. They said they’re trying to figure out why the aircraft didn’t gain altitude after takeoff. 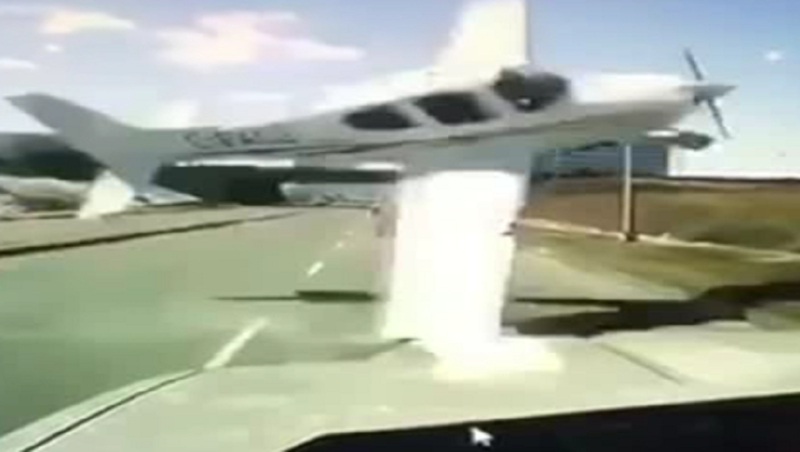 The dash camera captured the plane narrowly missing the vehicle's front hood. 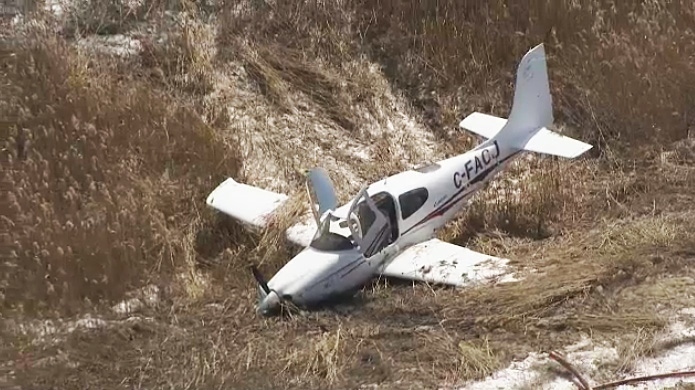 Aerial footage of the crash shows a small aircraft lying in a ditch just north of Buttonville Airport on March 12, 2019.